Big Sky, Montana is a golfer's paradise. Stunning landscapes, snow capped mountains, endless green grass, abundant wildlife, and the sounds of nature make Big Sky the ideal setting for a round of golf. Golfing in Big Sky is one of the best things you can do on a bluebird Montana day. Try it and find out for yourself. The Reserve At Moonlight Basin - The Reserve is a members only club that features a Jack Niklaus designed golf course. The 8,000 yard course is 18 holes and par 72. The course sits at 7,500 feet and offers stunning views of Lone Mountain and the surrounding Madison Range. The Club At Spanish Peaks Mountain Club - The Club at Spanish Peaks Mountain Club is a members only golf course designed by Tom Weiskopf. Join and you can play golf at 7000' on an 18 hole, par 72, 7,200' yard course in the middle of Big Sky, Montana. Yellowstone Golf Club at Yellowstone Club - The Yellowstone Golf Club is a members only golf course. This 18 hole, par 72 course was designed by Tom Weiskopf. The Yellowstone Club was ranked as one of the top 25 golf communities in the country by Travel & Leisure Golf magazine. To join one of these members only golf courses, contact the clubs directly or speak with a local Big Sky based real estate agent. Big Sky Resort owns and operates Big Sky's public golf course. 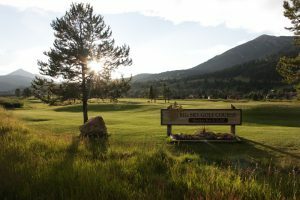 The Big Sky Resort Golf Course is located in the Big Sky Meadow. You'll drive right by it whenever you come to Big Sky. This award winning Arnold Palmer designed golf course is an 18 hole, par 72 golf course featuring 6,806 yards. The course is located at 6,500 feet above sea level. 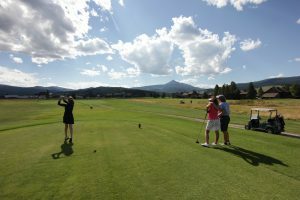 Anyone can go golfing in Big Sky at the Big Sky Resort Golf Course. The views are jaw dropping and there's a good chance you'll spot wildlife on the course while you're playing. Keen golfers often spot moose, elk, deer, beaver, even the occasional bear. Golfing in Big Sky is fun. Book a tee time online and go play 18 holes at the Big Sky Resort Golf Course. Or stop by the driving range, take a lesson, book a golf pro, join a clinic, or enter one of 7 golf tournaments hosted at Big Sky Resort Golf Club. Golfing in Big Sky will challenge any level of golfer. It's an entertaining place to swing a club - especially since your golf balls will travel farther. 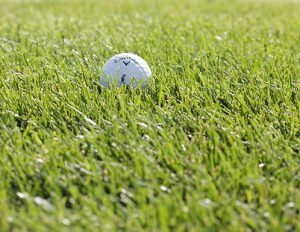 If you're keen to explore even more golf options in the greater Big Sky area, you can find even more golf course information here. Now go outside, swing some clubs, hit some balls, enjoy the fresh air, and have fun! Who's Excited For Summer In Big Sky?